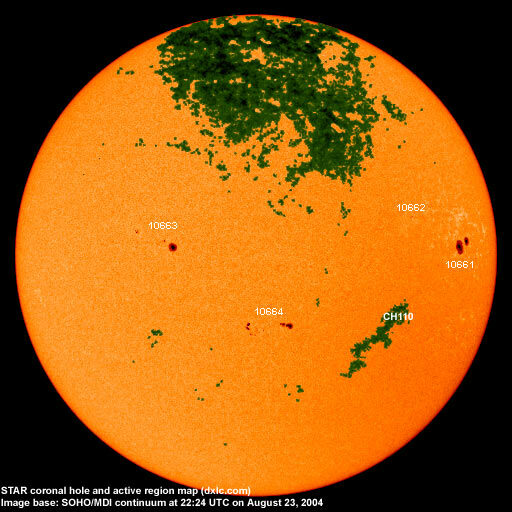 Last major update issued on August 24, 2004 at 03:45 UTC. 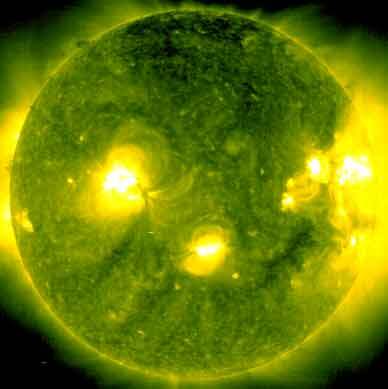 The geomagnetic field was quiet to unsettled on August 23. 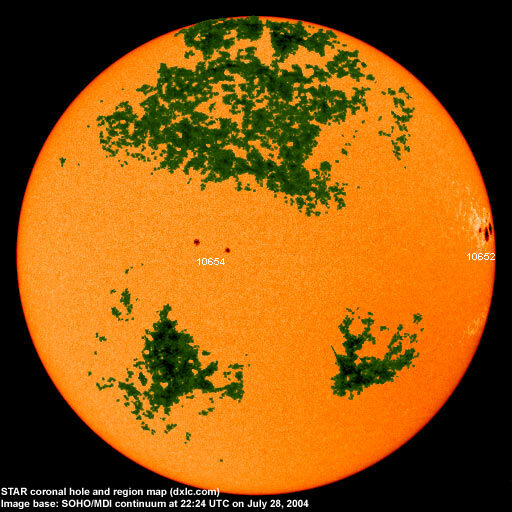 Solar wind speed ranged between 362 and 452 km/sec. Solar flux measured at 20h UTC on 2.8 GHz was 109.5. The planetary A index was 7 (STAR Ap - based on the mean of three hour interval ap indices: 7.9). Three hour interval K indices: 22222322 (planetary), 23223322 (Boulder). Region 10661 decayed slowly and quietly. Region 10662 decayed further and has only a single small spot left. Region 10663 decayed slowly with penumbra disappearing from the trailing spots. Region 10664 lost some intermediate spots, however, new spots emerged both in the leading and trailing spot sections. 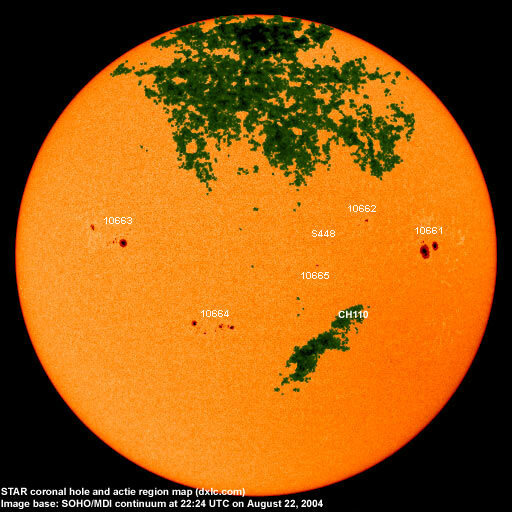 August 21-23: No obviously Earth directed CMEs were observed. 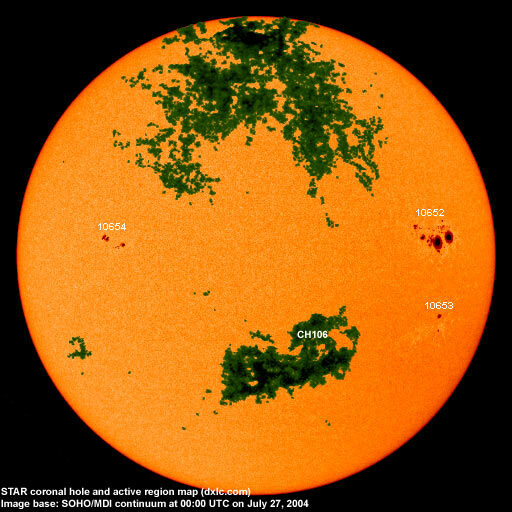 The northernmost extension of a coronal hole (CH110) in the southern hemisphere was likely in a geoeffective position on August 21. 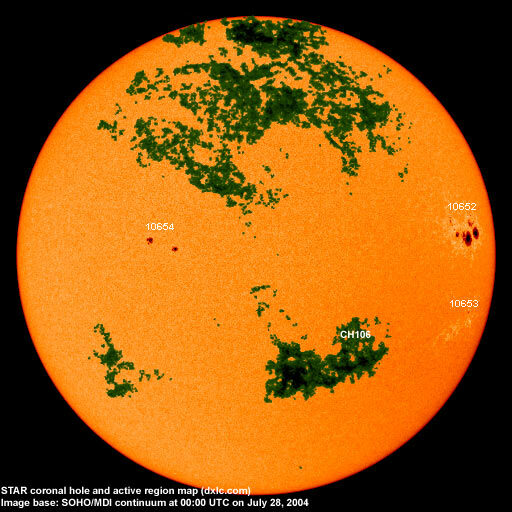 The geomagnetic field is expected to be quiet to active on August 24-25 due to a weak coronal hole flow and quiet to unsettled on August 26-27. Long distance low and medium frequency (below 2 MHz) propagation along east-west paths over high and upper middle latitudes is poor to fair. Propagation along long distance north-south paths is poor. Trans Atlantic propagation conditions are monitored every night on 1470 kHz. Dominant stations tonight: Radio Vibración (Venezuela) with a weak signal. Stations from Venezuela were observed on a number of other frequencies including 970, 1110, 1140, 1420 and 1430 kHz. From North America signals were heard on 20-30 frequencies, mostly with stations from Newfoundland, Nova Scotia and the New York area.